Today's the big day! We're getting a new president! Barack Obama is being sworn in, which means it's his first real day as Mr. President. What do you think he'll do first? I don't know, but I hope he decides to use that big old White House lawn for something more than just growing grass. Maybe he'll get sheep and let them graze on the lawn! Izz! That's the WHITE HOUSE you're talking about. Not just some guy's backyard! Yeah, so what? Woodrow Wilson did it when he was President. The sheep mowed the lawn to save energy, and their wool was used too. And remember how San Francisco's City Hall turned their lawn into a veggie garden? You never know, maybe President Obama will like the idea. 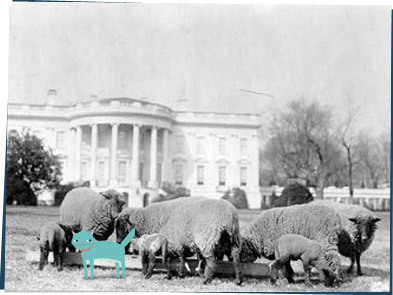 Check out the Eat the View website where people have lots of ideas about how to make the white house lawn greener!